Could François Fillon have won Sunday’s French presidential election? When I look at the final tally of votes in Sunday’s French presidential election — François Hollande took nearly 52% of the vote against incumbent Nicolas Sarkozy’s 48% — I cannot help but note that the margin is actually lower than in 2007, when Sarkozy beat Ségolène Royal with 53% of the vote. It’s quite stunning — an election that was supposed to be a landslide for Hollande, in which every poll showed him beating Sarkozy by anywhere from five points to double digits, turned out to be closer than the Sarkozy-Royal race. So when I look at that — and when you look at exit poll data showing that many Hollande voters were motivated not by Hollande, but rather by the desire to give Sarkozy the boot, I really wonder what would have happened if Sarkozy had stepped down from the presidency in favor of his longtime prime minister François Fillon. Fillon has actually quite amazingly defied political gravity. The prime minister post in France has long been notorious as a career-ending post, especially for prime ministers that hail from the same party as the president (during what the French call cohabitation — i.e., when the president comes from one party and another party controls the Assemblée nationale, and essentially, controls domestic policy — the prime minister has had more power and tends to fare better: Jacques Chirac was the first cohabitation prime minister in the 1970s and went on to win the presidency eventually; Édouard Balladur, who was a cohabitation prime minister from 1993 to 1995, and Lionel Jospin, who was a cohabitation prime minister from 1997 to 2002, however, did not). But in non-cohabitation times, the prime minister role has been unforgiving. Édith Cresson, who served briefly as prime minister in the early 1990s under François Mitterand (still the only female French prime minister to this day), saw the role end her career. Her successor, Pierre Bérégovoy, faced such criticism that his tenure ended when, after the Parti socialiste lost legislative elections, he committed suicide. Jacques Chirac’s first prime minister from 1995 to 1997, Alain Juppé, became embroiled in a public funds scandal, and lost his seat in the 1997 legislative elections, which the Parti socialiste, under Jospin, won. Juppé only recently returned to the highest level of French policymaking when Sarkozy appointed him as his most recent foreign minister in 2011. Later on, Chirac’s final two prime ministers, Jean-Pierre Raffarin and Dominique de Villepin, both saw their favorability ratings plummet while in office. In de Villepin’s case, he remains so unpopular that he failed to gather enough signatures to make the ballot for the 2012 presidential election. Not so with Fillon, whose favorability ratings have been consistently higher than Sarkozy’s. While Sarkozy has never quite shaken the image of the ‘bling-bling’ president who married Carla Bruni and spirited off to tour the ruins of Petra in Jordan and Disneyland Paris with his new bride, Fillon received much of the credit for pushing through with quiet dignity and competence those items of Sarkozy’s agenda that have actually become law — such as the raising of the retirement age from 60 to 62. 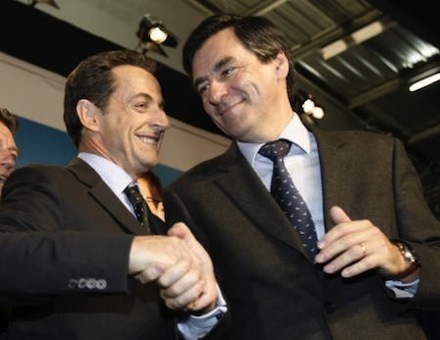 Fillon is also well known for a proposed law (‘le loi Fillon‘), which would have reformed the French educational system, but was defeated on the strength of student protests in 2005. So when I see the closer-than-expected result in Sunday’s presidential election, I see an election that was not pre-destined for the French right to lose. It’s fantasy to assume that a political creature like Sarkozy would have walked away from the French presidency. Yet in the face of yet another financial crisis last November, and with an unfavorable rating already twice as high as his favorable rating, it is not out of the realm of possibility to imagine Sarkozy standing down in order to focus, statesman-like, on the European economy. There are a handful of center-right pols who may well pick up the pieces of Sunday’s presidential defeat: Juppé, Jean-François Copé, the leader of the latest generic form of French center-right, Gaullist party entity, the Union pour un Mouvement Populaire (which is just a warmed-over rehash of Chirac’s Union for a Presidential Majority), and, of course, Fillon, who will almost certainly take a central role in France’s center-right politics in the post-Sarkozy era and who subtly distanced himself from Sarkozy in the final days of the presidential campaign, when Sarkozy veered, somewhat snarlingly, to the uncomfortable space of the far right. Of course, Fillon will knows that the center right will face no small challenge — starting with June’s parliamentary elections — from the Front national and Marine Le Pen, who will also be angling to bring her far-right political movement, which won 18% of France’s first-round presidential vote, more fully into the mainstream of the French right over the next five years.